2016 RRTTLC - Martie, Vol II, Nr. 1. - Date ASTTLR:CUI 28916696. Cont bancar Ro03 BTRL 0130 1205 E819 63XX, deschis la Banca Transilvania. 2016 RRTTLC - Martie, Vol II, Nr. 1. This article describes the results obtained in a pilot study addressing dyspraxia in the speech and language field in Romania. 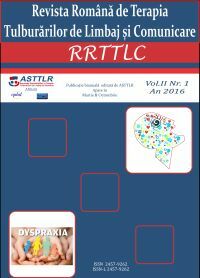 The main objectives of this study is to establish if dyspraxia is a frequent diagnosis in speech and language therapy, to underline if this diagnosis is just a specifier in a wider range of disorders or disabilities and to underline if there is a need to address this diagnosis during the initial training and continuous professional development for Romanian speech and language therapists. Results proved that there are no differences in approaching this diagnosis in our country comparing with data from abroad, except regarding the need for speech and language specialists initial training and continuous professional development in this specific area. We all know that blind children may have difficulties in reading and writing in Braille. For this reason, we think that a presentation of ways in which these difficulties could be prevented may be necessary. Thus, in this article, we will try to present some modalities in which parents and teachers may adapt some strategies of learning to read and write in Braille, starting from the pre-reading stage. We will also present some strategies in which tactile books may be adapted, because reading through images is an important basic skills for all children, even with or without disabilities. In the first part of this article the author presents the main implications of cerebrovascular accidents on speech. These complex implications need to be approached during the speech and language therapy in a multidimensional way. But besides the classical the therapeutic approach, the author underlines the fact that eating disorders are also an important aspect to be considered during the therapy. Thus, the second part of the article presents a speech and language approach in a case of cerebrovascular accident where the focus is on deglutition and eating, swallowing and drinking disorders. This paper focuses on the importance of early intervention as far as language development for children with Down syndrome. Children with Down syndrome have a delay in the development of communication abilities because of the sensory, perceptual, physical and cognitive issues they face and which affect their development path. The anatomical and physiologic characteristics frequently met among children with Down syndrome are represented by differences of the muscles and facial structure, which lead to language disorders such as: hypotonia, poor lips, tongue and oral cavity coordination. The physical features of these children (tongue protusion, predominantly oral breathing, irregular dentition, ogival palate) highlight difficulties for small and precise movements of the mouth which limits tongue movements when speaking. The problems mentioned above affect the children’s intelligibility of speech for with Down syndrome in the following areas: articulation, rhythm and fluency, resonance, phonation. This paper proposes an approach which focuses on the development of the suprasegmental aspects of speech, the development of immediate imitation abilities, the development of focused attention, establishing eye contact, the development of phonoarticulation using orofacial stimulation (the Morales technique and using special instruments – Sensory Therapy instruments, Z-vibe – an instrument with vibrations). The purpose of this article is to underline the main features of reading a case study of the children diagnosed with stuttering. Thus, in this article is presented a case study, which contains an assessment process and intervention approach focused on reading fluency in the context of stuttering. Results demonstrated that an adequate assessment and intervention can ensure functional development in reading fluency even in stuttering cases. Persuasive - communicational and cathartic valences of the voice in psychotherapy and in vocal euphony. therapeutic persuasive-communicational valences of the voice; the emotional-cathartic valences of the voice in melotherapy; the eurythmics – a contemporary model of connection between movement, rhythm and sound; the therapeutic valences of vocal euphony. The insistence is on the efficiency of these approaches in the case of persons in difficulty due to illness or disability. vocal euphony, emotional valences, cathartic valences. The speech intelligibility degree of the hearing impaired children speech varies widely, from completely incomprehensible to almost functional. Although a number of studies have documented typical speech disorders of the hearing impaired children compared with hearing children. regardless whether it refers to adults or children, normally developed or with different types of disabilities. This study examines several acoustical microbarriers, such as: noise, reverberation and speaker-listener distance, and the impact of these variables on the speech perception abilities of both children with hearing loss and children with normal hearing. From a practical standpoint, we discussed several methods for eliminating some of these communication barriers, such as improving the acoustical environment in the classroom and managing student’s behavior. The study also presents some of the effects of the acoustical environment on the children’s academic achievement, as well as behavior when speech perception is compromised, ending with suggestions on using smart technology applications for monitoring the noise level hence the student’s behavior in the classroom. Speech intelligibility of people with hearing disability, who are using a conventional or digital hearing aid or a cochlear implant, is an essential factor that interferes in the communication process with people with normal hearing. Without being understood oral language cannot be an efficient and safe way in the communication process, and in this case, the language cannot exercise its primary function of communication. The current study aims to highlight the degree of development of speech intelligibility for students with hearing disability who are using digital hearing aids and those with cochlear implants. Recordings were made with students reading lists of words and sentences, witch played to three inexperienced listeners that had to write down (transcription) the words correctly perceived from the students reading. To establish the speech intelligibility, has been applied The Speech Intelligibility Rating Scale (SIR). The main reason for the selection of this topic is to show that speech intelligibility of children with digital hearing aids and cochlear implant is influenced by many factors that have an impact on oral language development. Among them there are: the type of hearing aid used, the degree of hearing loss, the communication mode used, the beginning of intervention for recovery. Speech intelligibility of students with hearing disability can be improved by applying appropriate strategies and individualized recovery. Keywords: hearing impairment, speech intelligibility, cochlear implant, hearing aids, speech and language, auditory-verbal therapy. case study reveals the need for complex long-term intervention for these pupils.